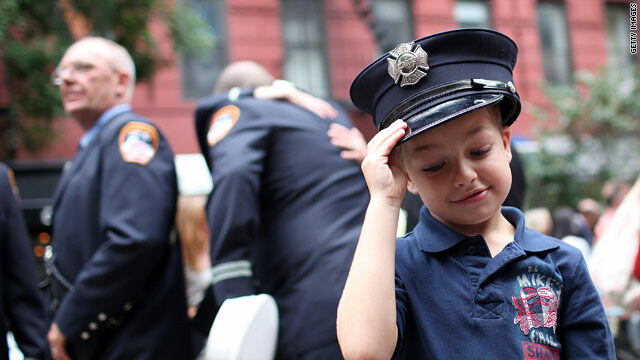 Peter Samuelson, 6, tires on a firefighter hat after a memorial service Sunday at Old St. Patrick's Church in New York City. Twitter users and bloggers were keen Sunday to share tributes to the victims and heroes of the September 11, 2001, terrorist attacks. Frequently used Twitter hashtags included #Sept11, #NeverForget, #WTC, #FDNY, #Wherewereyou, #911whereiwas, #NYC, #godblessamerica, and #RIP 9 (which probably was supposed to be 9/11, but Twitter cut it off after the slash). FDNYnews: Today we honor the 343 #FDNY members & thousands of others killed 10 years ago. They were all heroes. Queen Rania of Jordan: As we remember that tragic morning ten years ago today, let us work together for better understanding and reconciliation. 1PolicePlaza: Today we remember the 23 NYPD Officers, NYC's finest that were killed at the site of the WTC. Anonym_Iran: On 2001/09/11, thousands and thousands Iranians went instantly in the streets with candles in homage to the victims. JennymontyinSD (Jennifer Montgomery): I was working in the US Capitol, the Let's Roll heroes of Flight 93 prob saved my life. Peace, Love, & Remembrance to all. Pandaa_TC: It's hard to think that the victims of 9/11 were home sleeping in bed with their families 10 years ago. RIP 9/11. New York poet Amalie Flynn completed a year-long project to post a short poem every day to remember 9/11 and honor its victims and heroes on her blog at http://septembereleventh.wordpress.com/. A blogger called Star Bear on WordPress.com wrote, among other things, "Things are changing, some minds are changing. There are quiet, joyful voices singing in harmony. Peace to you this day, may your heart be filled with peace - and joy." Filed under: History • September 11 • Terrorism • Twitter • U.S.
Why dint the oklahoma bombing get this much coverage every year. Just when u get over thus tragedy, the government and media blow it out if proportion and fake terrorist threats. If the terrorists was smart they'd watch our news and know when to plan an attack. The boy eho cried wolf. Each year on 9/11 the media and govermwnt start up plot rumors to send people into panic mode. I wonder how many mire hate crimes we had yesterday. Thinking I'll take a long poop on a plane and add water on my face when I walk out the door. Didn't need to know that last part Justin, bathroom duties should stay in the bathroom.